In the year 1605, Juan de Onate, a Spanish conquistador and one-time governor of the New Mexico Territory, incised three words in the face of Morro Rock, near the Zuni Pueblo in New Mexico. Paso por aqui. Came this way. 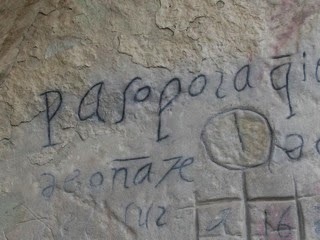 An early example of graffiti or tagging, but by no means the first in this continent. Imagine what those words meant to others passing along the trailway at the time. Another had been here, taken the time to leave a mark, perhaps a reassurance that the traveler who came upon this was not lost. Something tangible, perhaps even a city, awaited. Paso por aqui has become among other things a mnemonic for the Hispanic presence in the area, an armature about which to wrap multifarious historical date of comings and goings. The University of New Mexico has an archival and publishing program built around that concept. Eugene Manlove Rhodes, a name well known to readers of Western fiction, was often referred to as "the cowboy chronicler." After seeing the inscription, he wrote a memorable novel of the West, Paso por Aqui, in which a bank robber, being pursued by the famed lawman, Pat Garrett, comes upon a farming family, afflicted with diphtheria. Thus two examples of the effect of someone passing through. When you were a boy, following with excitement the denouement of World War II, another form of Paso por aqui proliferated, possibly initiated by one or more adventurous American servicemen in the European Theater of Operations, the famed Kilroy was here. How many boys would be boys at such a glorious possibility? You and how many thousands of boys like you added to the ubiquity of Kilroy? 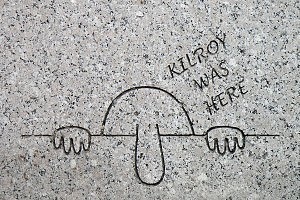 Was there ever a single Kilroy? There must have been. Of equal possibility, the echt Kilroy was some innocent, an inspector of some sort, leaving proof he'd been where he ought rather than an inspired maker of myth and mischief. Writers, for their part, take delight in myth and mischief, creating characters and their deeds, hopeful of leaving some identifying mark on the rocky facets of their culture. Arthur Conan Doyle, for instance, created a cultural icon in Sherlock Holmes, trying at least once to kill Holmes off by way of putting an end to Holmes's popularity so that Doyle could get back to his more "serious" work. We know how that turned out. When you heard of writers racing the clock against the final bell, you used to think they were driven to finish in order to fulfill some inherent desire to leave one last thing for humanity, some parting gift for the system that spawned, nurtured, and shaped them. This seemed a lovely thought, a splendid empathy. If you could manage such a thing on your own way out, you reasoned, you might actually have effected a balance where your departure would be a happy one. A lovely thought. The rough edges of your teen and twenties and thirties cynicism have long since been sanded and burnished away, leaving the marshmallow center of some sort, some individualistic, mischief-sponsored optimism in place, where the tyrants and the intransigent are brought down by the revolution of laughter and ridicule, rendered with excellence in narrative form. The realization is strong with you: After a time spent trying to hone a craft, the eagerness to finish this one last thing is not motivated by altruism, nor is it driven by misogyny. The answer is rather plain: the simple, driving joy and enthusiasm of having forged a sense of craft that has begun to pay off. Onate passed by here. Kilroy was here. Banksy tagged here. You've drawn hearts and initials in the sand, carved a few on trees, a few picnic benches here and there. Your true legacy is the enthusiasm of words rushed down on some page or screen in some fit of passion or other, each time in the hope you've managed this time to get it right. Some times it is sitting nearby. In your enthusiasm and eagerness, you walk past it, only to have to retrace your steps, then approach it, sitting, amused, waiting for you to claim a moment of its intense presence and meaning.